Mercedes just presented its strategy for the Geneva Motor Show. It’s called “Dream-car initiative” and includes the presence of some new roadster and cabriolet models. First step for making hot weather tolerable: buy a cabrio Mercedes! Because there will be plenty to chose from starting from next month. 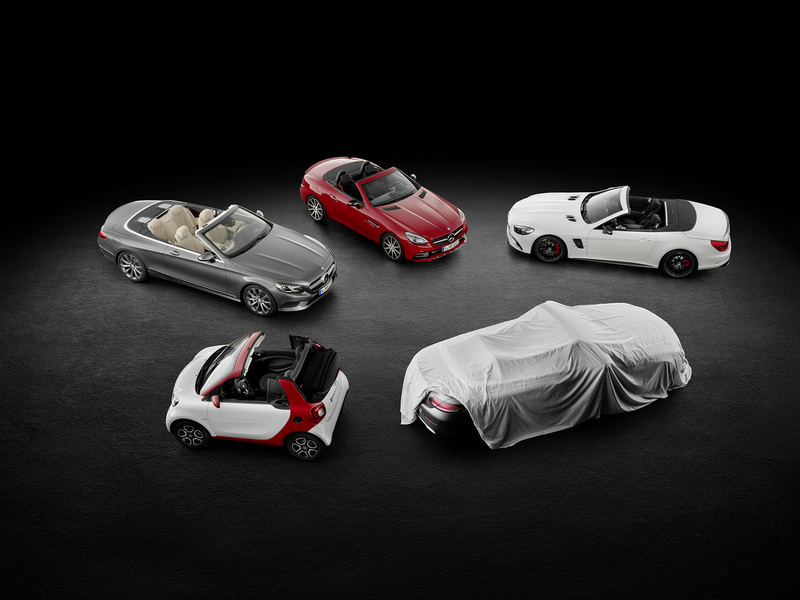 Mercedes prepares to show for the first time the new C-Class Cabriolet. It will have a classic soft top and most probably frameless windows, being built on the W205 platform, as all the C-Class family. Moving one step up, we find a European premiere, the SLC roadster. Feeling confused? SLC is the old SLK. Its gasoline engine range contains a 2.0 l petrol engine of 184 and 245 hp, and a turbocharged 3.0 liter engine, capable of 362 hp. The diesel consists of the well-known 2.1 engine, developing 204 hp. The European prices start from 34.927 € but go over 60.000€ for the best-equipped version. Next, it’s the new SL’s turn to hit the European market. We saw it first at LA Auto Show, and we liked its wide engine range, developing from 362 to 621 hp. It has a new face and a slightly changed silhouette, for a more dynamic look and its price starts from 99.100 €. A special model, commemorating 130 years since the automobile’s invention, will be shown at Geneva: Mercedes-AMG S 63 Cabriolet Edition 130. We’ll also see another world premiere, as the Smart Fortwo cabrio Brabus Edition will be unveiled at next month’s show. Enough with the cabriolets: the new Mercedes-AMG C 43 4MATIC Coupé will join the C-Class family, while the E-Class’ 10th generation will show itself for the first time in Europe. And finally, you’ll have the chance to see the V-Class’ new Exclusive line. The Mercedes stand itself will be like a big silvery-sculpture, which will be the house of 37 dream vehicles for ten days.